Every one should be well versed with the escape route in the event a fire breaks out at home or workplace. The most important rule is to stay calm and proceed to safety quickly. A flame can get out of control very easily so it’s important to make use of every second. Fire escape drills may seem troublesome but the practice can be put to good use in a real fire. Building your own escape method is another option if you happen to be stuck and have nowhere else to take shelter. It is possible to conjure your own escape plan if you can stay calm and think logically. Usually, the things at home or around you can be used to get out from a dangerous situation. How to build a fire escape? A simple way to construct a fire escape ladder is by using timber and rope. Firstly, measure the height of the drop where you’ll be using the escape device. The rope has to be twice the length of the height so because you will need to conjure multiple knots along the way. Choose a natural fiber rope (i.e. sisal or manila) because they do not catch fire or melt easily. It is not advisable to use synthetic material that gives way to heat easily. You will need two ropes, one for each side of the ladder. Next, you need timber. The remaining wood panels should be spaced approximately 12 inches apart to form the steps. The spacing between each step can be adjusted according to your preference. Next, you need to drill holes into the timber. The holes should be approximately one and a half inches from each end. From the bottom, tie a double knot in the rope and then feed it through the first ladder step. Feed it through the next step approximately 12 inches up. Repeat these steps until the rope is long enough to reach the window pane. The final piece of timber is the longest, allowing you to actually hang the rope from the window. After constructing this, remember to try it out. Make adjustments if necessary. Having a fire escape device is crucial because you will never know when you need it. You and your family members can also share peace of mind knowing where to go in the event a fire breaks out. Always place your highest priority in personal safety and don’t attempt to take your belongings with you. 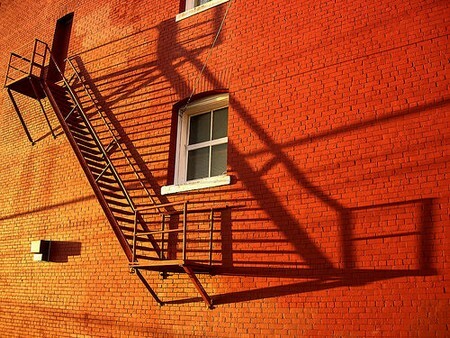 This is a simple method on how to build a fire escape. There are many other methods, so make sure that you find out more.